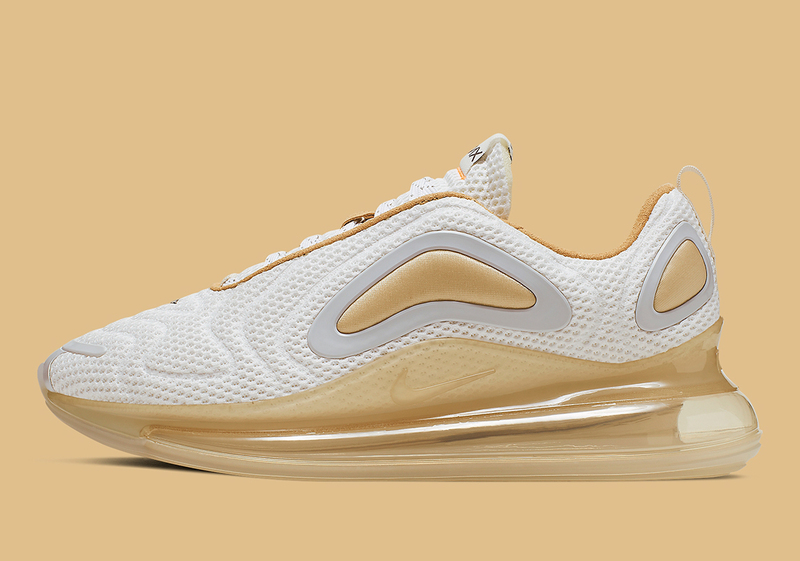 By now, the Nike Air Max 720 should be a household name when it comes to Nike sneakers. It is the Beaverton brand's 2019 entry into the Air Max line and promises to be one of the most versatile yet. With a bulky air max unit that wraps all the way around the shoe, Nike is going all out with this latest model. Over the last few weeks, numerous colorways of the Air Max 720 have been revealed to consumers and in that timeframe, many have hit the market with varying degrees of success. As 2019 rolls on, Nike is ramping up its efforts and shown off yet another colorway. This latest offering is dubbed "Pale Vanilla" thanks to its muted colors. The upper is primarily made with creamy white mesh, while light grey and tan accents make up the rest of the shoe. The midsole and air max unit come in a semi-translucent tan, which is also found on the side and heel panels. Interestingly enough, the outsole has a patch of orange which stands out amongst the muted colors. According to Sneaker News, there is no release information for this shoe, although you can expect it to drop in the next few weeks for $180 USD.